Prominent & Leading Exporter from Jaipur, we offer diamond jewellery, diamond necklace, diamond studded gold jewellery, diamond stud earring, diamond studded bangle and diamond brooches. Diamond Jewellery is the best choice for all occasions because trends of various jewelleries comes and goes but diamond is one such product whose demand can never subdued in the market. With time more and more types of diamonds are hitting the market like pink diamond, blue diamond, green diamond etc. We deal in all colors and types of diamonds with varieties in shapes and sizes. Heart shaped diamond jewellery set, cross shaped sets and flowers shaped sets are some of the common diamond jewellery sets. Diamond Necklace is the best choice for all occasions because trends of various jewelleries comes and goes but diamond is one such product whose demand can never subdued in the market. With time more and more types of diamonds are hitting the market like pink diamond, blue diamond, green diamond etc. We deal in all colors and types of diamonds with varieties in shapes and sizes. Heart shaped diamond jewellery set, cross shaped sets and flowers shaped sets are some of the common diamond jewellery sets. Diamond Studded Gold Jewellery is the best choice for all occasions because trends of various jewelleries comes and goes but diamond is one such product whose demand can never subdued in the market. With time more and more types of diamonds are hitting the market like pink diamond, blue diamond, green diamond etc. We deal in all colors and types of diamonds with varieties in shapes and sizes. Heart shaped diamond jewellery set, cross shaped sets and flowers shaped sets are some of the common diamond jewellery sets. Our Diamond Stud Earrings that exhibits style, which is difficult to get elsewhere, thus, is an ideal for wearing on any kind of dressing which makes our appearance highly attractive. These are available in various sizes based on the requirement of the client. These pendants have an excellent grace & sophistication, which gives an everlasting appeal to any woman. Diamond Studded Bangles are stunning and very precious. They impart a look of beauty to your wrist and you can use them with both, traditional and modern outfits. Diamond bangles are usually studded with emeralds, rubies and other precious gemstones. Our company has successfully able to market it traditional designs blend with contemporary style bangles in not only the national market but also in the international market. Diamond Brooches offered by us is very lucrative and stunning. It is the best gift that you can ever give to your loved ones. Moreover, our diamond earrings are just superb and they can match with any kind of dressing you choose whether Indian style or modern. You can wear it to parties, weddings and even meetings. You can choose from our wide range of white diamond and colorful diamond earrings that are designed by our team of experts who have knowledge about the trends and choice of our clients. Diamond Bracelets are stunning and very precious. They impart a look of beauty to your wrist and you can use them with both, traditional and modern outfits. Diamond bangles are usually studded with emeralds, rubies and other precious gemstones. Our company has successfully able to market it traditional designs blend with contemporary style bangles in not only the national market but also in the international market. Our Diamond Mangalsutra are quite precious but they have a stunning look with breathe taking appearance. These necklaces are fitted with various kinds of stones like sapphires, pearls, rubies, emeralds etc. 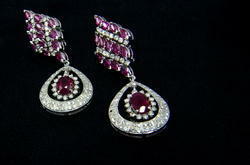 they not only make the diamonds looks the best but also attract the viewers towards the wearer. Our elegant and outstanding designs cannot match with any other competitors in the industry. The glossy look, shinny appearance and the perfect finishing touch make our product the number in the entire industry. Our Diamond Necklace Sets are quite precious but they have a stunning look with breathe taking appearance. These necklacesets are fitted with various kinds of stones like sapphires, pearls, rubies, emeralds etc. 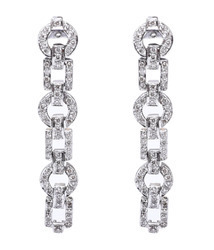 they not only make the diamonds looks the best but also attract the viewers towards the wearer. Our elegant and outstanding designs cannot match with any other competitors in the industry. The glossy look, shinny appearance and the perfect finishing touch make our product the number in the entire industry. We offer Diamond Pendant set. These are well polished and smoothly finished these gemstones are widely demanded and applauded by our valued clients. All the products offered by us are well tested and analyzed on distinct parameters. We offer them at competitive prices at international standard. They are highly appreciated for their unmatched in designs and perfect in finish. We offer these necklaces in 14k, 16k and 18k gold. 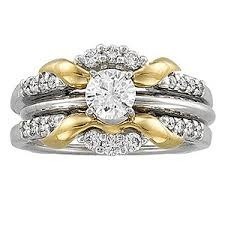 We take pride in designing a Solitaire Ring for occasions such as an anniversary or birthday. These diamond rings are available with beautiful designs and fine cutting of diamond. The range is available in varied shapes, sizes and designs to fulfill different requirements of the customers. Our range of products is stringently checked by a team of quality controllers on defined parameters, such as finishing, quality of material used and designs.